ROYAL OAK, Mich. – Shortly after the ball dropped at midnight on January 1, 2015, the Detroit Zoo had something special to celebrate ¬– an endangered male Grevy’s zebra born at 2:45 a.m. at the zebra habitat. The foal – named Enzi, a Swahili word meaning “era” or “reign” – has been kept indoors during the frigid months since his birth, but will be seen outdoors on days when the thermometer reaches 50 degrees Fahrenheit or warmer. This is the second foal for 23-year-old mom Elvira and 14-year-old father Z.Z. 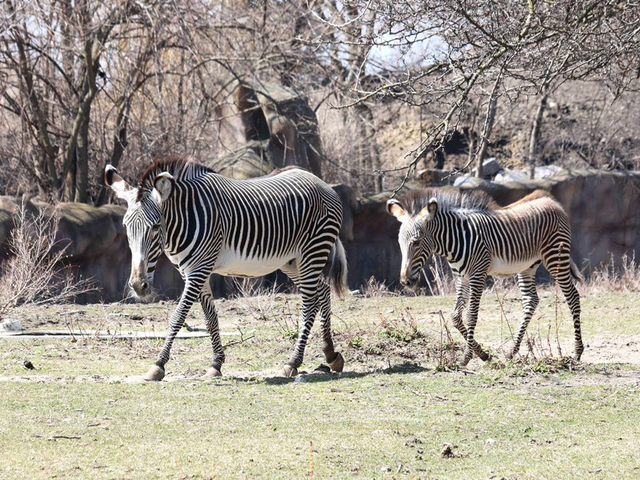 The new arrival brings the Detroit Zoo’s zebra herd to five, including the pair’s 3-year-old male offspring Jimmy and 12-year-old female Zoe. The Grevy’s zebra (Equus grevyi) is the largest of the three zebra species, with adults weighing between 800 and 1,000 pounds. Zebras are born with brown stripes that turn black as they mature. The striped pattern on each zebra is as unique as a fingerprint; no two are the same. The species is named after Jules Grevy, former president of the French Republic, who received the animal as a gift. The Detroit Zoological Society – a nonprofit organization that operates the Detroit Zoo and Belle Isle Nature Zoo – is recognized as a leader in conservation, animal welfare and sustainability as well as providing sanctuary for animals in need of rescue. With an annual regional economic impact of more than $100 million, the Detroit Zoo in Royal Oak is one of Michigan’s largest paid family attractions, hosting more than 1.3 million visitors annually. Its 125 acres of award-winning naturalistic habitats are home to more than 2,500 animals representing 280 species. The Belle Isle Nature Zoo sits on a 5-acre site surrounded by undisturbed forested wetlands on Belle Isle State Park in Detroit and provides year-round educational, recreational and environmental conservation opportunities for the community. For hours, prices, directions and other information, call 248-541-5717 or visit www.detroitzoo.org. The Woodward Spine was the brainchild of Michael Fossano and Jeffrey Buck, two Royal Oak, Mich. natives who met nearly 10 years ago while attending the now-defunct George A. Dondero High School. It seemed fitting for the two Wayne State University alums to craft an outlet to help continually refine their writing skills, while also serving as a trusted source of information for the metro Detroit community. The Woodward Spine aims to inform its readers about relevant news and events through creative and informative posts not only by Mike and Jeff, but other upstanding citizens as well who are driven and proficient in these core areas: news, opinion, entertainment, history, sports and development. The Woodward Spine serves the tri-county metro Detroit area, however concentrating mainly on the communities that lie along the Woodward corridor. 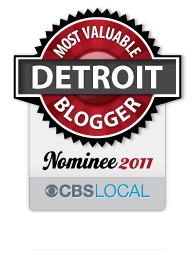 This entry was posted in Detroit and tagged animals, detroit, enzi, Royal Oak, zebra, zoo. Bookmark the permalink.